Cellvizio®, the Fastest Way to See Cancer, is an Optical Biopsy system that generates microscopic images of internal tissue instantaneously and in a minimally invasive manner. 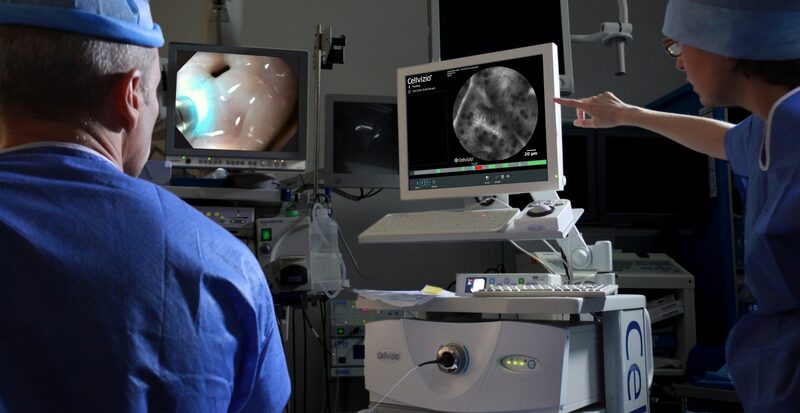 Cellvizio® allows physicians to take Optical Biopsies for the ﬁrst time, viewing live tissue inside the body at the cellular level in real-time, while using their regular endoscopes. This means a diagnosis can be made in a minimally invasive and instantaneous manner when compared to traditional “blind biopsy and histopathology” method and that physicians can make treatment decisions on the spot. Based on a technological challenge, the original idea for Cellvizio® may have seemed somewhat far-fetched but it is relatively simple: Transpose the technologies from astrophysics to medicine, combine them in a single device together with optical and endoscopic technology, using cutting edge computer processing. Its creators’ objective? Detect cancer as early as possible, with as few constraints as possible for the patient. Endoscopy allows the interior of organs to be seen, by inserting a mini-camera with macroscopic vision, held inside a tube containing a light source and a channel for accessories, into the body’s ducts and cavities. It is often used when taking biopsies for subsequent microscopic analysis (anatomical pathology). This examination is very commonly carried out at a hospital or in a specialized clinic, under local or general anesthesia depending on the organ or area of the body being examined. It is very often used to detect pre-cancerous or cancerous lesions. Nonetheless, it does have some limitations for a precise and fast result: on the one hand, the endoscope is both very limited in its channels of access and its resolution; conversely, the microscope has very good resolution but can in no way be used on the patient and is therefore used exclusively ex vivo, on samples that have been taken; Since it is impossible to be able to “see” inside the organ and observe the cells in the mucous membrane examined, the biopsies are taken “blindly” and samples are taken randomly; The ablation of all or part of the organ may be avoided, with a precise result.